Blowouts aren’t an everyday thing. The cost of going to a salon along with the time it requires makes it incredibly inconvenient for most women. Hot air brushes, though, nullify both these factors and make blowouts a luxury that you can pamper yourself with every day. When you get the right hot air brush, you’ll be able to style your hair while drying it! The best hot air brushes will allow you to straighten your hair, add waves, get big curls, or even create little bouncy curls. Then, there’s the benefit of being free of frizzy and flyaway hair as well that you can’t ignore. The best part is that you’ll be able to do all this without any damage to your hair as was the case with old school heating irons. You won’t even have to worry about teaching your wrists to bend and turn at unrealistic angles with certain types of hot air brushes. Multiple colors, brush widths, and features in one rotating hot air brush available at a great price! A nearly flawless static hot air brush that is virtually perfect for all hair types and lengths, ionic technology protects hair. Super cheap, super light, and with dual voltage functionality to boot!, 2 barrel options to choose from. In this guide, we’ll explore everything you need to know about hot air brushes. The information here will help you pick the right one but if you wish to skip all of that, then we have a very detailed list the 9 best hot air brushes available in the market right now. Here’s everything you’ll find in this guide. What Are Hot Air Brushes? What Are The Different Types Of Hot Air Brushes? Which Hot Air Brushes Are Right For You? Have you noticed how your hairstylists seem to grow out a new arm while doing your hair? One hand controls a dryer, another manipulates the brush, and another materializes out of thin hair just for kicks and holding stuff? Well, with a hot air brush, you won’t need that third arm. In fact, you may not even need the second arm that much. Maybe you can sip your morning coffee while styling your hair? What a novel idea! 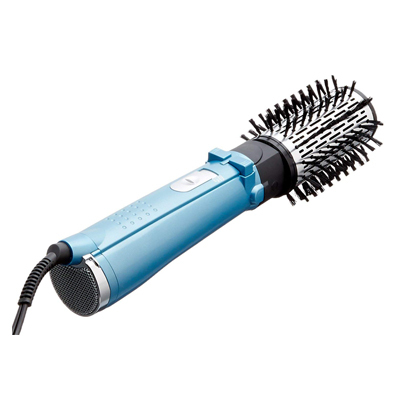 A hot air brush is a direct replacement for two appliances – the blow dryer and the round hair brush. Hot air brushes can dry and style your hair simultaneously. In fact, some hot air brushes can be used without all the complicated wrist and arm contortions to get the right curls. The different types of hot air brushes available in the market are static, rotating, multipurpose, and paddle. Static brushes are hot air brushes that have holes in the brush area. Hot air blows through these holes to dry your hair while you use the brush. To style with static hot air brushes, you’ll still need to learn the right way of moving the brush through your hair. Rotating hot air brushes, as the name suggests, rotate while you brush your hair. As a result, these types of hot air brushes are not demanding on your arms and wrists. They don’t require you to manually twirl the brush through your hair. In most cases, these brushes rotate both ways, which makes them even more user-friendly. However, hairs may get stuck and pulled in rotating hot air brushes if the design isn’t completely right. Multipurpose hot air brushes come with multiple heads of different width/thickness. The fact that you can detach one head and put on another means that these are the most versatile types of hot air brushes. Paddle hot air brushes are the traditional paddle brushes with holes around the bristles. These hair brushes double up as hair dryers. At most, they can be used to straighten the hair but styling with curls and waves are beyond them because of their shape. Hot air brushes can be categorized on the basis of barrel materials as well. Modern hot air brush barrels are made up of aluminum, tourmaline, and ceramic. Tourmaline and ceramic barrels are preferred by experts because they’re safer when compared to aluminum barrels. Aluminum barrels have a tendency to overheat which can not only damage your hairs but also your fingers if you happen to touch it by mistake. Tourmaline and ceramic barrels, on the other hand, conduct heat well but never get so hot that they can’t be managed without oven mittens. The most obvious choice should be to pick tourmaline ceramic barrel brushes over aluminum ones. They’re safer after all. While choosing between rotating and static hot air brushes, your decision will mostly be informed by your preferences. If you know you won’t be styling your hair a lot and will only straighten them, then paddle hot air brushes will be the best option for you. In contrast, multipurpose hot air brushes are for women who style their hair regularly in various forms. Barrel thickness is something that you’ll have to consider while picking the best hot air brushes too. The thickest barrels i.e. 2-inches are ideal for women with thick and long hair. Medium thickness barrels i.e. 1.5-inches are perfect for women with shoulder length hair, while women with short, fine, or thin hair should be picking the thinnest barrels i.e. 1-inch. This is easily one of the most popular rotating hot air brushes in the market right now. It boasts of all the features that you would want to see in your modern hot air brush. It rotates both ways. This function is easily accessible through a simple button placed on an ergonomic handle. The barrel is 2-inches thick which makes this brush ideal for thicker, fuller, and longer hair. The hair brush is built around nano titanium technology. This technology allows the barrel to heat up quickly while making it very efficient at conducting heat. This technology is supplemented by ionic technology. Ionic technology allows for the release of negative ions which taking away frizz while adding shine and volume to your hair. The brush has three temperature settings – low, high, and cool, along with two speed settings. It comes in a soothing pastel blue color. The one area where BaBylissPRO can be said to be lacking is power output. It has a power rating of only 500 watts. While this is common with most rotating hot air brushes, many users still find it to be on the lower side. We should also add that this brush can pull hair. Therefore, you’ll need to be especially careful about your hair getting stuck between the rotating barrel and the plastic cap on top. However, keeping that from happening is mainly about skill that you should develop with regular usage. Some users have also questioned the reliability of the spinner on this device, claiming that it dies very soon. Other say that it lasts a long time which makes us think that it is a case of maintenance and not a design flaw. Compared to most other rotating hot air brushes in the market, BaBylissPRO is also very expensive. Further, if you travel a lot across the pond, you should buy a voltage converter because this device is built solely for the North American continent. Who’s it for: If you have long or thick hair and don’t want to contort your wrists, this rotating hot air brush will be perfect for you. 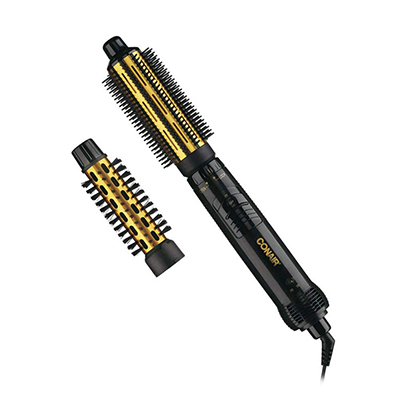 Conair has cornered a large chunk of the hot air brush market. They’ve achieved this mainly because of the wide variety of options they provide to their customers. One of their most successful hot air brushes is the INFINITIPRO and it is available in three different configurations. The configuration we’re focusing on here comes with a barrel that spans 2-inches. This makes this device perfect for women with long and thick hair. However, don’t worry if you have shorter or thinner hair because the other configurations are designed for you. You can get a set that has both a 2-inch and a 1.5-inch head or even one with just the 1.5-inch head. This versatility means that there’s an INIFINITIPRO for everyone, irrespective of the length or fullness of their hair. Conair has even paid attention to women’s need for the right aesthetics. This product is available in four different colors, which are plum, pink, black, and ombre. The barrel has a tourmaline and ceramic finish which ensures proper heat transfer and temperature stability. There are 3 heat settings – hot, warm, and cool for flexibility. The True Ion Generator keeps frizz away and the hair shiny. The barrel also rotates in both directions, boasts of antistatic bristles, and comes with a cover. Perhaps, the most surprising thing with this device is that it is long lasting. This isn’t something that many of its competitors can claim. However, like most rotating hot air brushes, this one also lacks for power. Its power rating is only 500 watts which means that it doesn’t blow as strongly as you may be used to with your conventional hair dryer. Unfortunately, this brush also has a tendency to catch hair between the plastic cap and the spinning barrel. This Conair hot air brush isn’t too expensive. Further, it isn’t a dual voltage device. Its cost is well within the accepted range for good quality hot air brushes. Who’s it for: If you want a long lasting rotating hot air brush and don’t want to spend too much, you should pick Conair’s INFINITIPRO. As far as blowing power is concerned, not many rotating hot air brushes can match Revlon’s Perfect Heat Spin Brush Dryer. It has enough power for you to not miss your traditional blow dryer after the switch. It has a power rating of 900 watts that allows it to not only blow strongly but also generate a lot of heat. The barrel spans 2-inches across, which means that it will be ideal for ladies with thick and long hair in search of voluminous curls and shiny hair. It will also not require you to do acrobatics while drying your hair since the barrel rotates in both directions. At the same time, it will build your wrist muscles and grip strength, since it is on the heavier and bulkier side. Its weight and bulk don’t allow it to be that travel-friendly either. Additionally, if you’re traveling out of the Americas, then you’ll need to get a converter because this device can’t support the voltage system on other continents. Further, the bristles on the barrel are soft but not so soft that they can’t grip your hair. There are two heat settings and a “cold shot” that come in very handy with elaborate hairstyles. One of the most important qualities of this device, though, is that it will not pull your hair. Its cost is competitive too. Although, slightly on the higher side. A bigger concern is the fact that it isn’t as long lasting as you would want it to be. There’re lots of women out there complaining that this device dies too soon. Also, if you’re considering a rotating hot air brush to deal with frizz in your hair, avoid this one. It doesn’t have any ionic technology so it may not be as adept as its competitors when it comes to removing frizz and flyaway hair. Who’s it for: If you want a lot of power in your hot air brush and frizz is not something you deal with every day, then this device is perfect for you. For a lot of us, rotating hot air brushes may be a bit too advanced. Keeping hair from getting caught in those brushes is a skill in itself. At the same time, we don’t really have to stick to the traditional rollers, blow dryers, and wooden brushes. This static hot air brush from the hairstyling icon John Frieda is the perfect compromise between those two extremes. It comes in two different configurations as well. Ladies with medium length hair can choose the 1.5-inch barrel while women with shorter hair can go for the 1-inch barrel. However, this hot air brush may not be that great for women with long or thick hair, unless they’re willing to settle for very loose curls. Moreover, without great skill, longer hair may get tangled in this brush too. Both barrels are especially perfect for women with thin and fine hair. Further, its heating element is titanium and ceramic which ensures proper heat transfer without over-heating. There’s also the negative ionization technology that nullifies frizz and flyaway hair along while adding shine and silkiness. Three standard temperature settings have been provided as well – cool, hot, and warm. Frieda’s design team has done very well with this device. It is the ultimate ergonomic hot air brush. It is light and its handle can be held and manipulated comfortably. There’s even the 360 swivel cord to prevent the wire from wrapping around you as you style your hair. The cost of this hot air brush is neither too high nor too low. The power output, however, is definitely low. 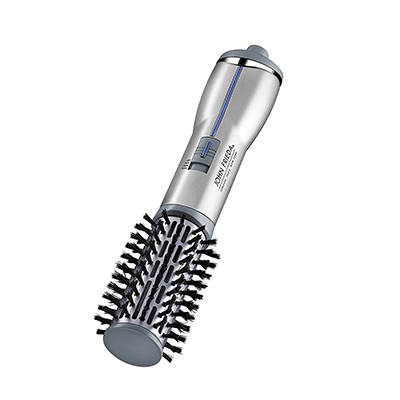 It has a rating of only 500 watts which means that it won’t dry your hair as quickly as you may want it to. 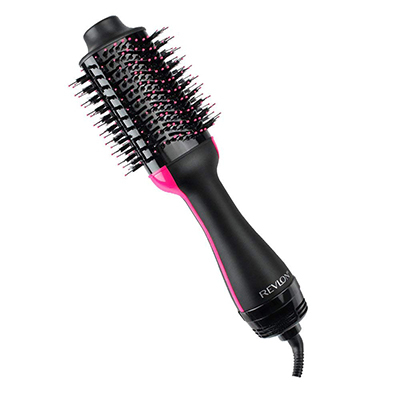 In fact, for best results, we recommend drying your hair to about 85% before using this brush for styling. There’s no dual voltage support either so you’ll have to buy a converter if you want to go to Europe or Asia. Who’s it for: If you have thin, fine, or short hair but still want to style them, then you should treat John Frieda’s static hot air brush as the best option. Women with long and thick hair not only need a wider brush barrel but also a lot of power. Revlon One-Step Hair Dryer & Volumizer is perfect for such requirements. 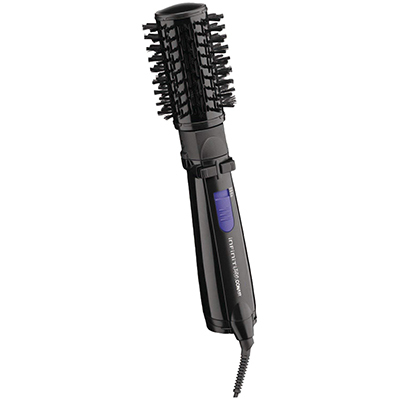 The barrel on this hot air brush spans two-inches which is ideal for heavy and long hair. It also has a great deal of power behind it. With a rating of 1100 watts, this device can blow air strongly and generate a considerable amount of heat too. As a result, it dries hair quickly, all the while volumizing it thoroughly. The downside of this barrel width and power is that this device isn’t really ideal for women with shorter, thinner, and finer hair. Not only will they find it difficult to wrap their hair onto the fat barrel but they may also feel that it gets too hot. This is also the only hot air brush in the market with an oval brush design. However, this neither makes much of a positive nor negative impact. The ionic technology in this device is very much in the positive column, though. It removes frizz, adds volume, and makes the hair healthier. As is normal with hot air brushes, three temperature settings are present in the form of medium, low, and cool. This device is quite bulky too. In fact, the thick handle isn’t really friendly to petite ladies with delicate hands. This hot air brush is also a bit too expensive, particularly since it doesn’t have a lot of staying power. According to a lot of users, this device stops working in a few months. Even the way this brush breaks down is consistent across users – motor burning out through overheating accompanied by a burning smell. The unhelpful heat setting button has also come under a lot of criticism from its users. Further, if you plan on taking this device to Europe or Asia, be prepared with a voltage converter because it is not a dual voltage device. 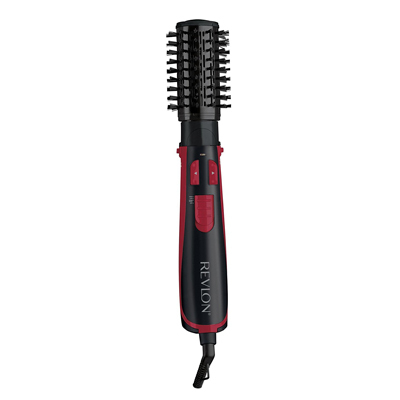 Who’s it for: If you don’t want to spend a lot of time pre-drying your hair before styling it, then this Revlon static hot air brush has enough power to fit your needs. While most hot air brushes in the market are designed for women with longer hair, there are still a few products that are intended for ladies with shorter hair. This hot air brush styler and dryer from Vidal Sasson is one such device. The reason why we’re saying that it is intended for the short hair crowd is its 1-inch barrel width. The barrel is thin enough to get close to your hair roots and create small, sharp curls with lesser hair. A thinner barrel will also suit you if you have fine and thin hair. Unfortunately, the brush lacks power. It has a power rating of a mere 250 watts. This means that it neither offers a lot of heat nor enough blowing power. This is another reason why we think that this brush is meant for women with either short or thin hair. Thin and short hairs do dry quicker after all. Still, owing to its low power, we advise drying your hair 90% of the way before bringing out this brush for styling and curling. 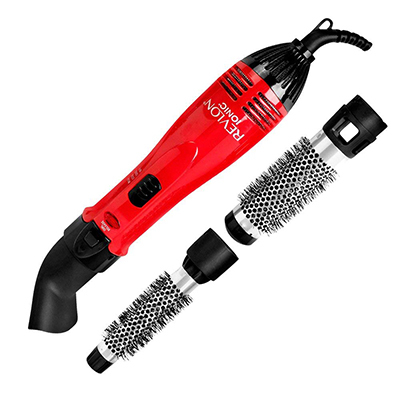 This hot air brush comes with two heat and speed settings, which adds some flexibility to your styling process. Further, the ceramic barrel keeps it from getting too hot as well. However, there is no ionic technology here to keep the frizz and flyaway hair at bay. Another quality of this hair brush is that its tip remains cool even when you’re using the high heat setting. This is helpful because it will prevent your fingers from getting burnt, giving you more freedom to manipulate the brush through your hair. One more thing that will help you manage this hot air brush is its thinner handle. Women with smaller hands will especially feel thankful for the thinner handle. This device also boasts of a curl release switch. This switch is designed for those scenarios where your hair is wound too tight or has become stuck somewhere in the brush. The idea is that you simply press the button and the hair comes free. This hot air brush manages to be lightweight and durable at the same time. Usually, you see lighter electronic devices being made up of weak plastic which makes susceptible to early retirement. This isn’t the case here. The Vidal Sasson hot air brush is very reliable, sturdy, and long-lasting. Its effectiveness and durability are reflected in its cost. It is quite an expensive device. It is also not designed to be used on other continents. So, if you plan on traveling, you might want to invest in a voltage converting adaptor. Who’s it for: If you have short, fine, or thin hair but still like straightening or curling your locks, then this Vidal Sasson hot air brush is just the thing for you. Multipurpose devices are those hot hair brushes that come with multiple, detachable heads. These detachable heads make the hot air brush very versatile and capable of dealing with multiple requirements. In the case of the Revlon Hot Air Brush Kit, you’ll be receiving two detachable heads in the pack. The first head or barrel will span 1.5-inches while the other one will measure 1-inch across. The 1.5-inch barrel will be ideal for women with medium length hair. This barrel will create bigger and looser curls. The 1-inch barrel is designed to be used by women with shorter hair or women needing tighter and smaller curls. Revlon hot air brushes usually tend to have a lot of power behind them and this multipurpose hot air brush is no different. It has a power rating of 1200 watts, which makes it one of the most powerful hot air brushes in the market right now. At the same time, for some reason, the designers have placed holes at the bottom of the head which allow a lot of the hot air to escape unused. 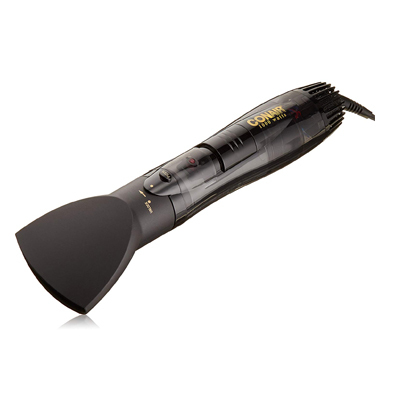 Its power output means that you won’t need to dry your hair before using this device to style it. Instead, you can use it to dry it off and style it straight out of the shower. However, if you prefer lower temperatures or lesser blowing power, this device does come with 3 different settings – hot, warm, and cool. This brush doesn’t rotate automatically, so you’ll have to manage all the movements manually. However, it will be easy for you to do that because this device comes with a full swivel cord that adjusts to your movements. The bristles on the barrel are short, soft, and designed to prevent your hair from getting tangled. This is a good thing especially at the heat levels you’ll be working with. This hot air brush is also surprisingly cheap until you consider some of its limitations. The foremost limitation is that the barrel is made up of aluminum. Combined with its power output, the aluminum barrel may end up damaging your hair, especially if you’re not an experienced user of such devices. Needless to say, prolonged exposure to excessive heat isn’t good for your hair. Even with the aluminum barrel, though, you’ll get the benefit of ionic technology. Used properly, this device will nullify flyaway and even frizzy hair. On the other hand, using this brush could have been easier. The heat toggle switch is especially problematic. A much bigger problem, when it comes to this device, is its longevity i.e. it is too short. The brush fails very quickly and the failure takes the form of the detachable head falling off its mount. This happens because the plastic that is supposed to hold the head wears off with repeat change of heads. Who’s it for: If you want a powerful multipurpose hot air brush but don’t want to spend over the top for it, then this device from Revlon meets all your requirements. Finding the right hot air brush can be particularly difficult for women with short or fine hair. There just aren’t that many in the market. Conair’s 3-in-1 kit is one option that does meet these requirements. It comes with two detachable brush heads or barrels – a 1.25-inch and a 0.75-inch, and a concentrator. The concentrator does the job of a hair dryer, while the two bristled heads can be used to dry and style hair at the same time. The width of the barrels means that this device is more suited to women with shorter, finer, and thinner hair. The 0.75-inch head is one of the thinnest available in the market and the 1.25-inch head is also designed for women with very short hair. Just because this device is meant for thin, short, and fine hair doesn’t mean that it lacks power. It packs 1000 watts’ worth of power which is enough for even women with thick hair. Even with all that power, this device remains incredibly lightweight. This will make it easier for you to move this brush around your head and not worry about wrist sprains. Your efforts will also be helped by its cool tip and “professional length swivel power cord”. However, because changing the attachments still remains a real chore. Most users of this device seem to be using their husbands for this little task, so you should be prepared for that as well. 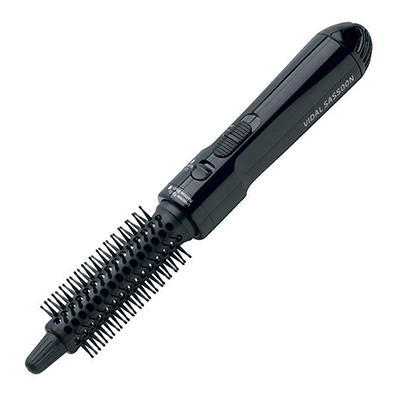 The attachments utilize tourmaline ceramic technology but the brush doesn’t have ionic technology to back it up. Therefore, while it does well enough against frizzy and flyaway hair, it isn’t flawless in that department. It is also worth pointing out that there are only two temperature settings on this brush i.e. high and low, while most of its competitors have 3. A much bigger problem is its durability. There are just too many reports of the attachments breaking off. The only saving grace is that this device isn’t too expensive. Who’s it for: If you don’t want to spend too much but still want a multipurpose hot air brush, this product from Conair is the one you should get. This is the only dual voltage hot air brush on this list. In fact, it may just be the only one available in the market right now. This device actually has a lot going for it which is why it is our top pick in the multipurpose hot air brush section. Its dual voltage feature means that you can use it in all countries without worrying about a converter or adapter. This hot air brush comes with 1-inch and 1.5-inch barrels, making it very useful for women with medium and short length hair. This versatility is definitely one of its greatest qualities. An equally great quality, though, is its weight. This featherweight hot air brush will be very gentle on your arms and wrists. It also heats up very quickly, which should save you a lot of time. It also boasts of a cool tip designed to make it easier for you to manipulate the device. The full flexible swivel cord does the same job. Further, there are two heat settings – high and low. The most astounding thing about this device is its cost. It is available at an amazingly low price, particularly if you compare it to other similar devices. It does lack for power, however, with a rating of only 500 watts. This means that you may want to dry your hair 80% of the way before bringing this kit out. We didn’t like the aluminum barrel either with the inherent risk of excessive heat damage to the hair. Finally, as good as this hot air brush is, it doesn’t stay with you for long. It stops working within a few months with the most common gripe of users being the brittle lock piece for attachments. Who’s it for: If you want versatility, affordability, and dual voltage, this is the best option out there.